I loooooove decorating and redecorating my entryway mantel. I don’t have a fireplace and keep considering installing one in our upcoming remodel. But then I think to myself how much it wouldn’t be physically used since Arizona is so hot 9 months out of the year but then I think of all the ways to decorate in and around and on top of it and I talk myself into it again: repeat! Until I decide, my entryway shelf will act as my mantel and I’ll keep changing it up seasonally, often several times in the same holiday. 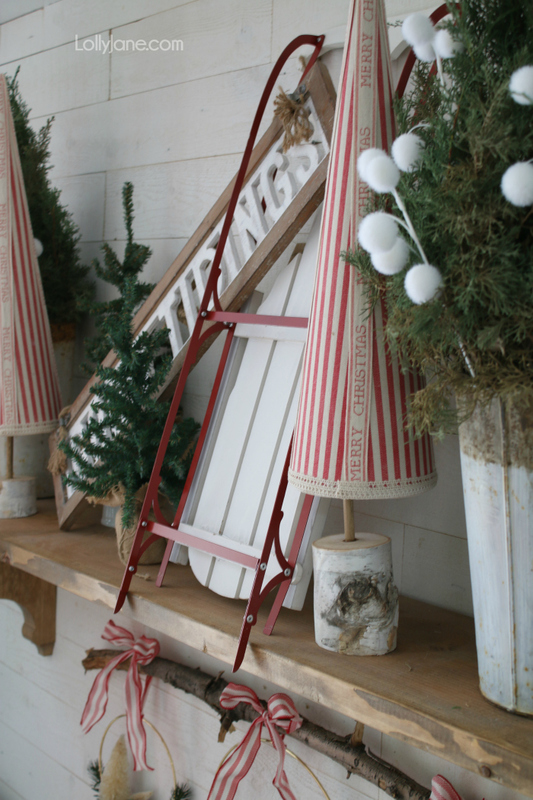 Kristi and I were shopping JoAnn’s for our latest Christmas decor needs and were walking through the trendy seasonal aisles, waiting for the decor to jump in our cart. The sled was our first find and we decided to make it the focal point, mostly due to its height but also because it’s too darn cute. 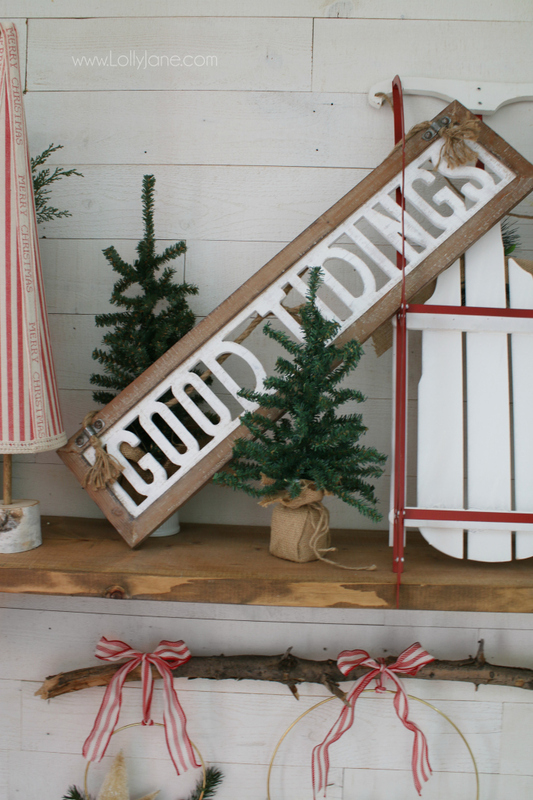 The glad tiding wood sign was our second score and within 30 minutes, we had a cartful of Christmas goodies with no set plan in mind. I was scanning our pin boards when Donna’s sled mantel caught my eye. 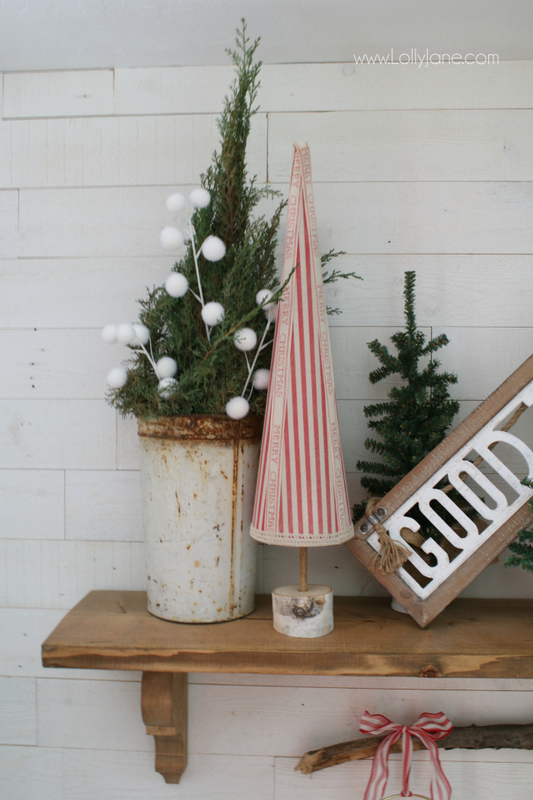 We mixed some vintage buckets found at a local boutique last week with fresh clippings from my trees with JoAnn’s fun white pom pom bush to blend new and old, our favorite combo. 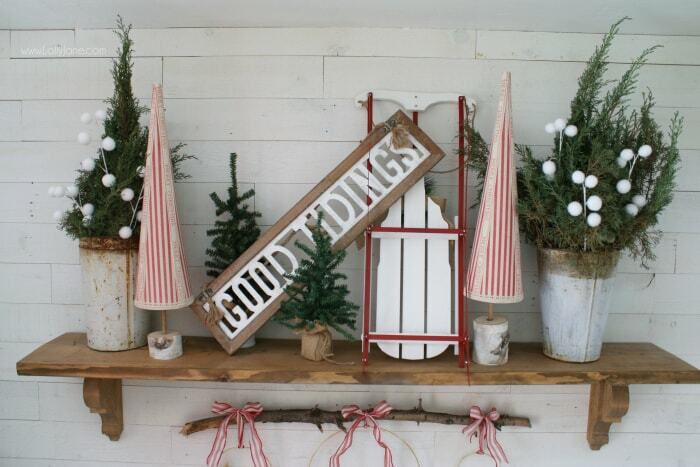 Read on for some fun Christmas mantel decor ideas, hope you love them as much as we do! What’s your favorite part? 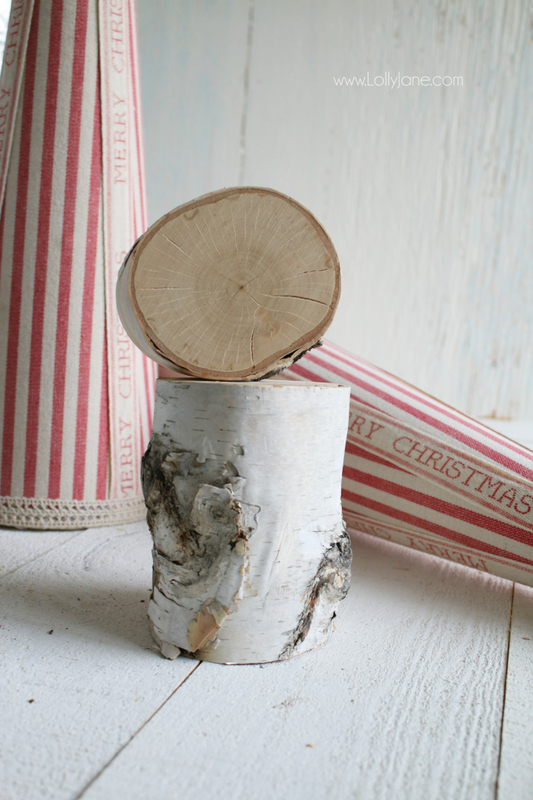 We had fun making these fabric ribbon wood slice Christmas trees! Read on for the easy how-to! You can buy 2 seperate pieces of wood but it was cheaper to buy 1 large size then cut it down myself. 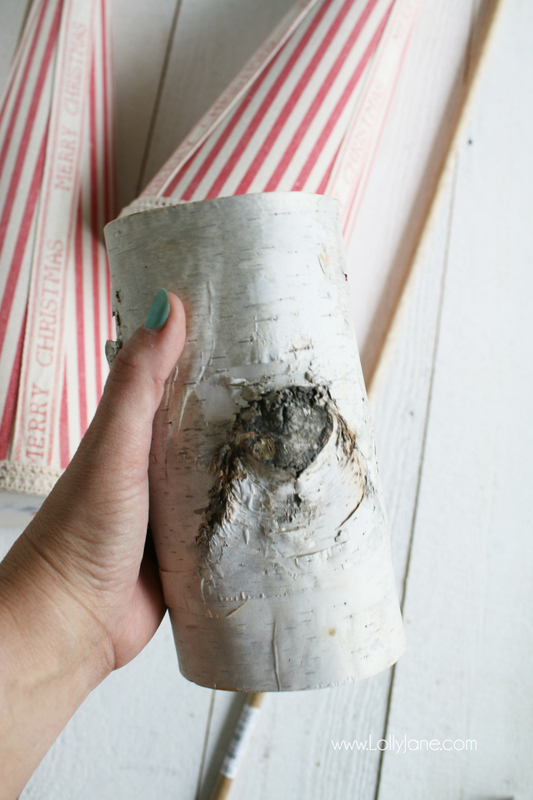 Cut the birch wood into two pieces, one size should be 1/3 the size of the 2nd one for shelf decor height variations. 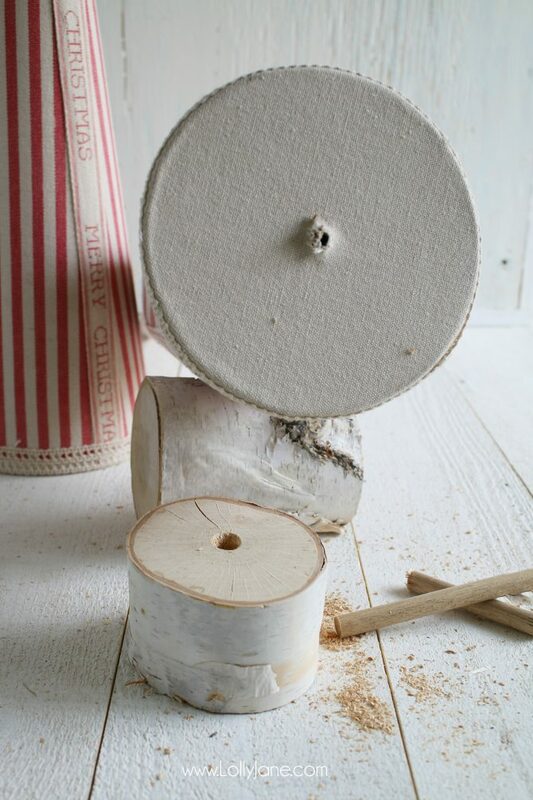 Drill a hole in the wood slice, this is where your wood dowel will go. 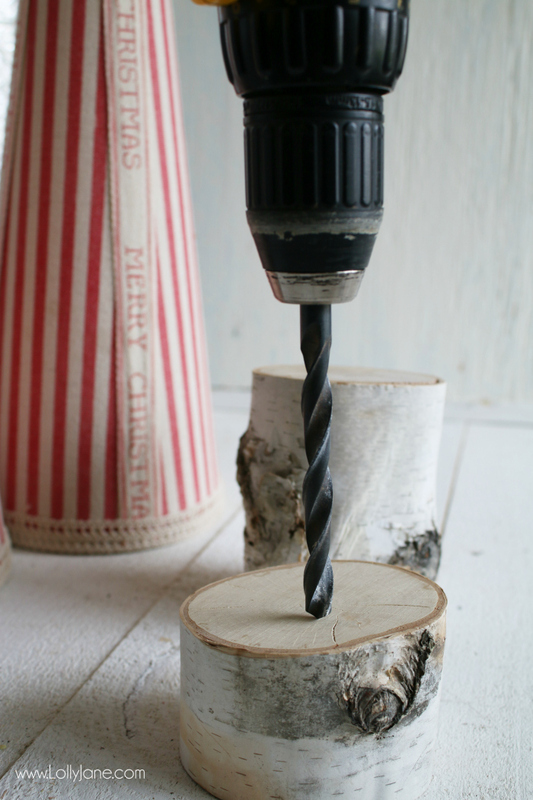 Drill a hole in the base of the Christmas tree as well. Glue the dowel into the wood slice, let dry (about an hour, sometimes 2 hours). 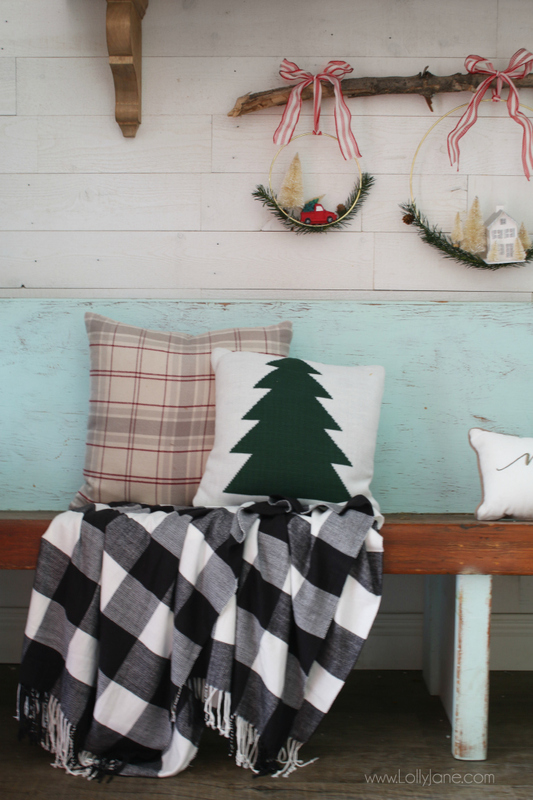 Look how festive your new fabric and wood slice Christmas trees look! 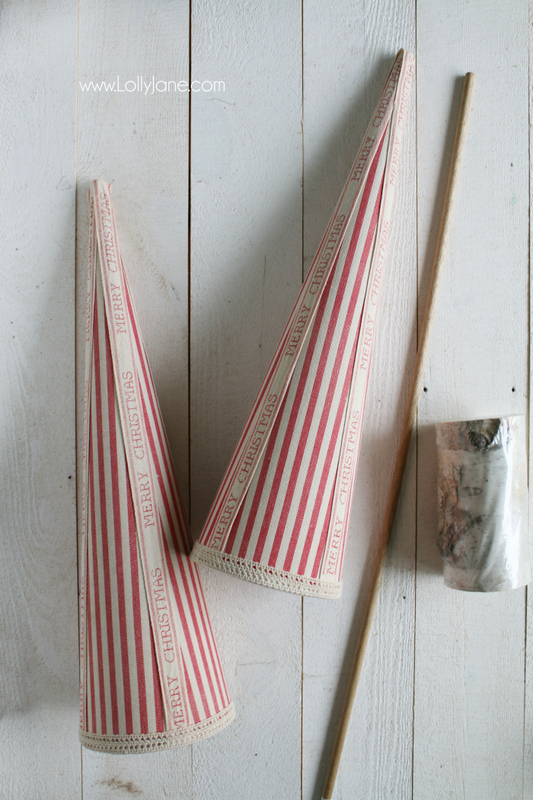 Love them with these old vintage buckets from Off the Dirt Road that I scored at Peppermint Lane Boutique last week. Kristi’s husband cut down my cypress trees last week but I grabbed these fresh greens before the tree went to the recycling center and love it in the old buckets! Enjoy the rest of the mantel, we’ll link sources at the end! 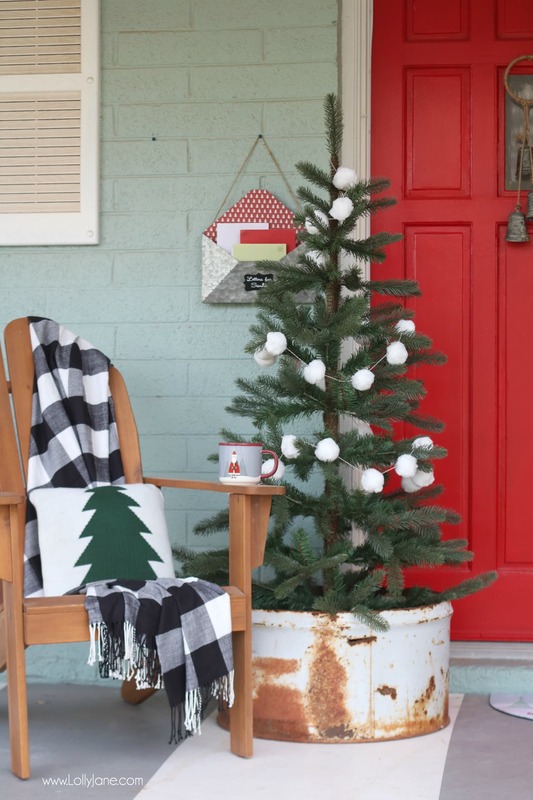 Aren’t our DIY Bottle Brush Wreaths sooo cute hanging from a branch? I ripped the dying branch from a tree in my yard and it was the perfect width to house all 3 wreaths! 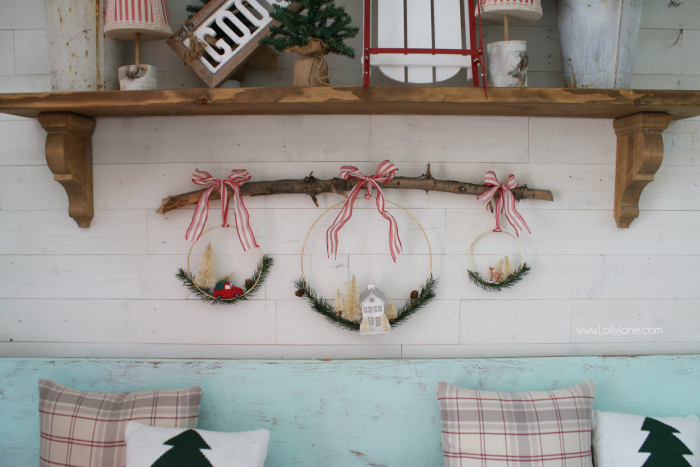 Have you seen the trend of a wreath hanging from a branch? So fun and easy to duplicate! 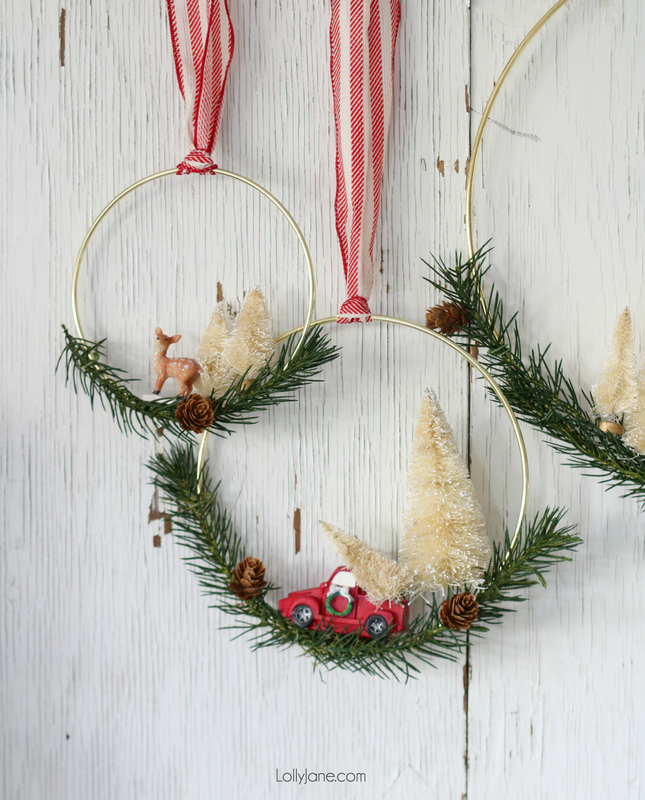 Here’s the tutorial on how to make your own bottle brush wreaths, we’d love to see yours, tag @LollyJaneBlog! 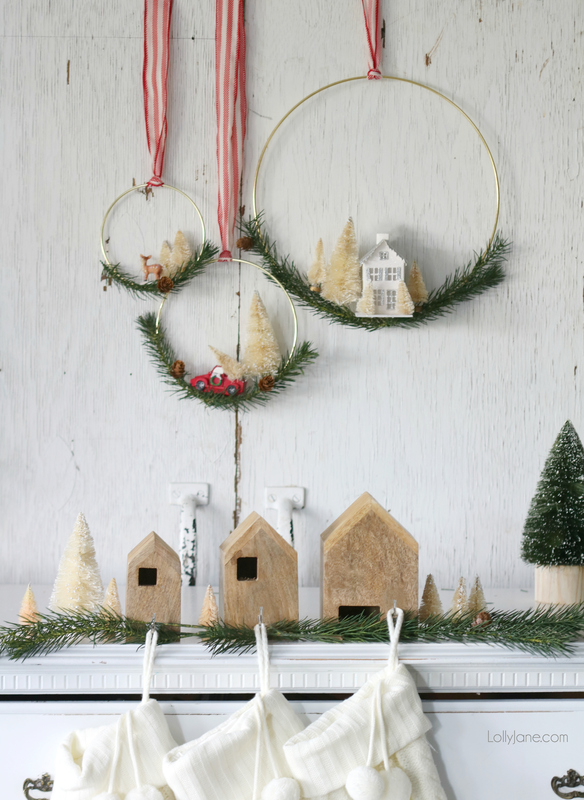 …or our Bottle Brush Christmas Wreaths are super popular and EASY PEASY to whip up to spruce up your holiday spaces! 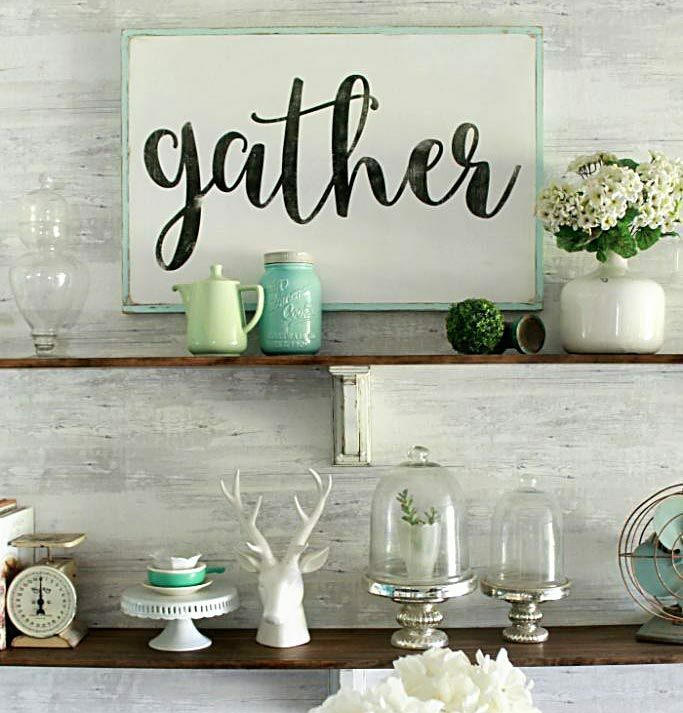 I love the mantel and how you styled it. The little trees are so adorable. 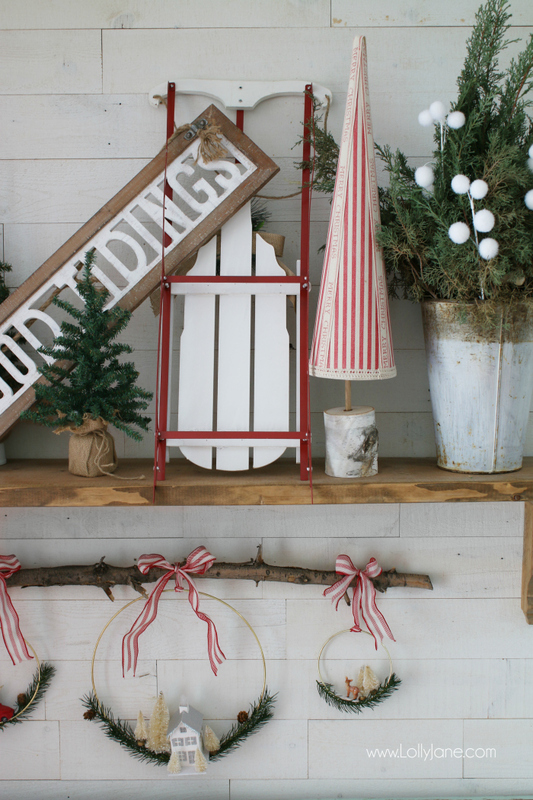 Love the sled arrangement on your mantle. Had a chuckle and I’m nodding my head over you “waiting for all the things to jump in your cart.” How is is that all these craft supplies still cost an arm and a leg, even when you have coupons? Your purchases may not be vintage, but they have that vintage look about them. 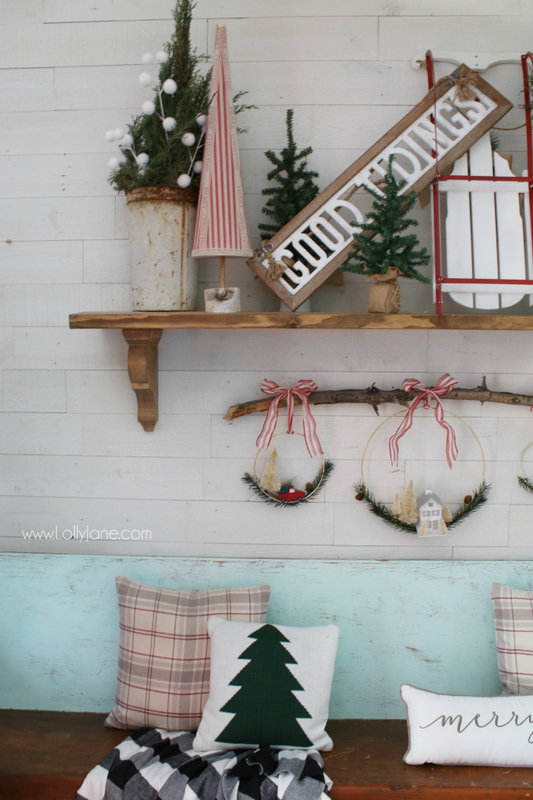 Very pretty vignette! Everything is so pretty and cohesive. I really like all the items and how you group them together. 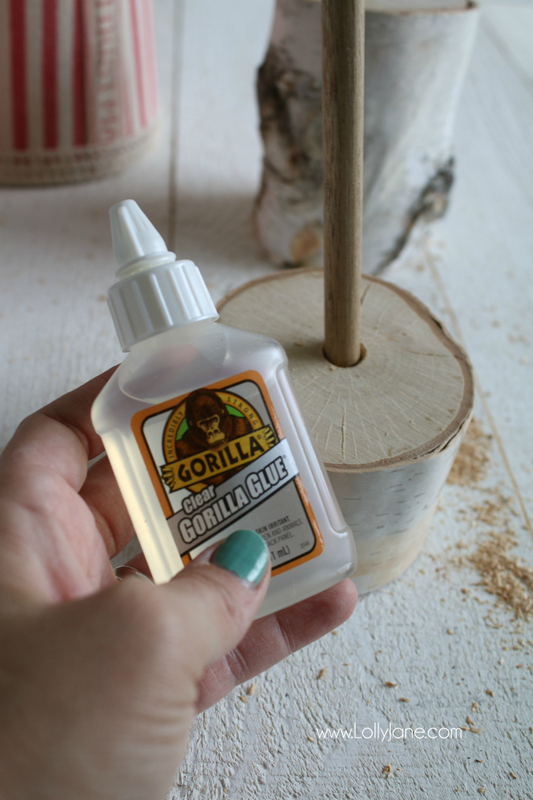 Gorilla glue is a must have in our home. The stuff is great. Your mantel looks wonderful! 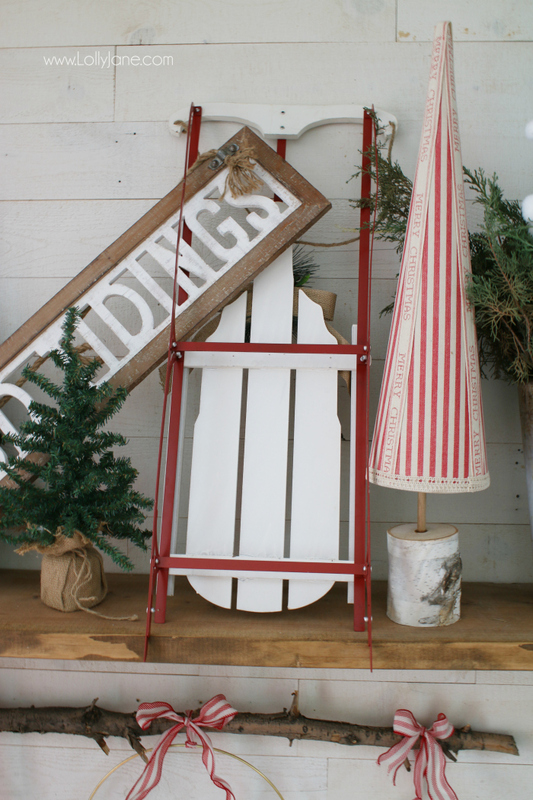 The blend of old and new is perfect, and my eyes were immediately drawn to that cute sled & sign. 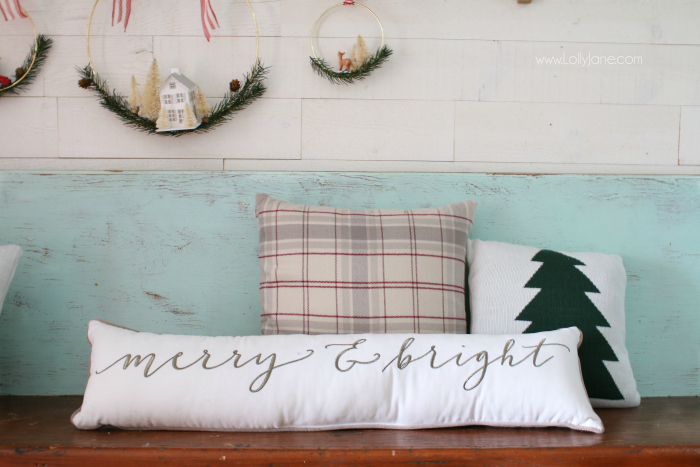 Thanks for linking up with Merry Monday – I’ll be featuring your mantel decor at our upcoming party. Merry Christmas! 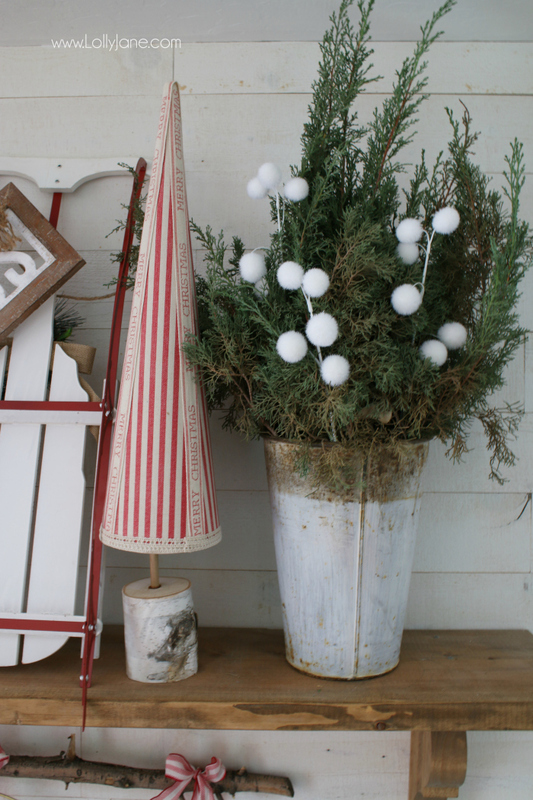 Will need to go back to where you told us where you got that adorable sled (and all the rest of it). Know what you mean about AZ being hot 9 months of year. I lived in Tucson for 20 yrs. ,we moved there when I was 10 yrs. old, grew up there and met my husband at Davis Monthan Air Force Base. I was working at laundry/dry cleaners by the base. All your decorations are so cute, made 3 of those “wreaths” myself,not as nice as yours tho, will need to redo them for next year. We don’t have a mantel either, have a shutter shelf Mr. Furry made for me few years ago and it gets decorated quite often. We don’t have an entry way, just come right into living room. into our single wide mfg. home. You two always do such great decorations. Love to borrow your ideas so often. 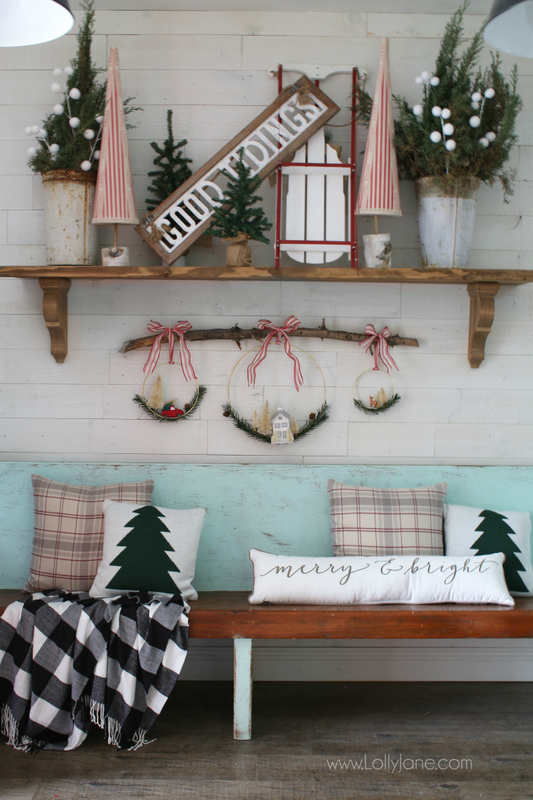 Love, love your mantle vignette and the old bench is amazing. Have a very Merry Christmas! Everything is so cute! Where did you get your bench or was it fit? I’ve been trying to find something similar for my entryway area. Thank you! It was a makeover from a lucky Craigslist find here locally in Arizona when a church was upgrading their pews. If you search “pews” there are almost always one or two available for sale, you just have to look beyond the 1960’s purple fabric… that’s what mine used to look like. 😉 Haha! Good luck!